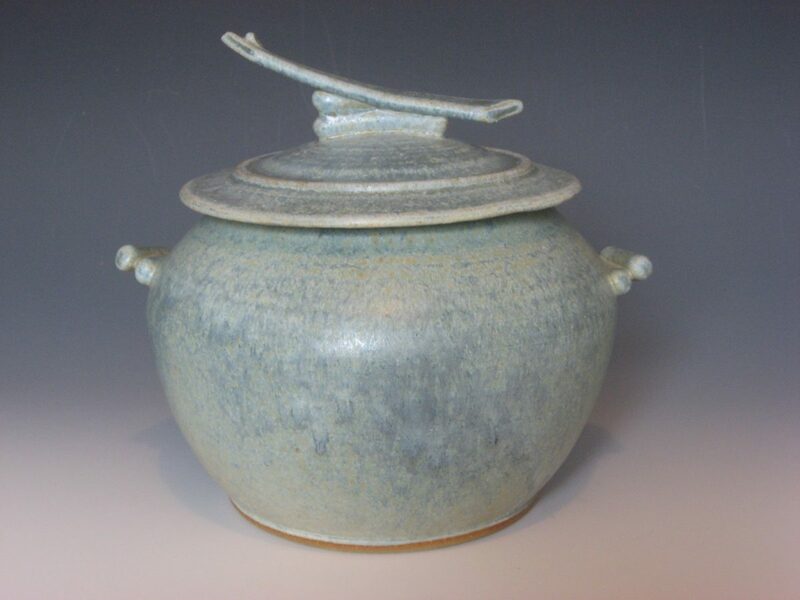 Kristin Landowski is an educator, writer and artist who has been working in clay for over twenty years. She received a dual Bachelor of Fine Arts from University of Wisconsin-Stevens Point in 2004 with an emphasis in Sculpture and Ceramics. 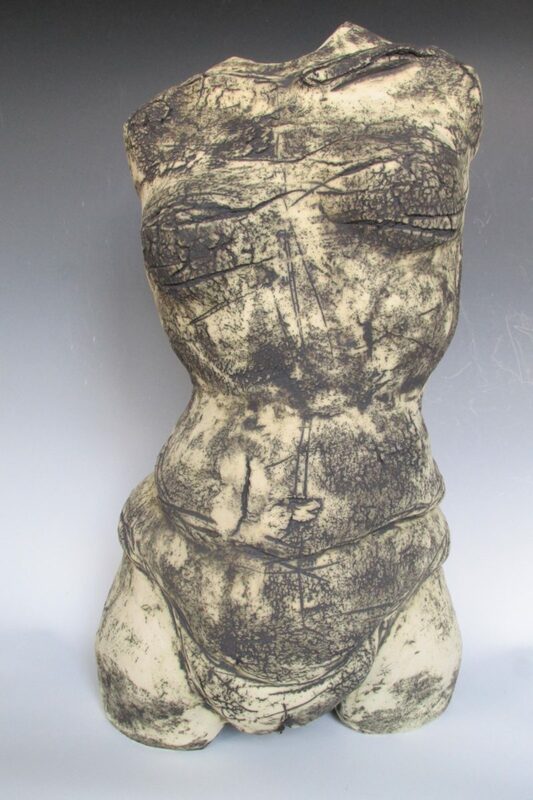 She graduated from California College of the Arts in 2017 with a dual degree: Master of Arts in Ceramics / Interdisciplinary / Installation and Master of Arts in Visual and Critical Studies. Kristin’s writing and figurative work focuses on taking what seems to be a virtual object and thrusting the invisible into the visible representation, calling into question if it can actually manifest itself. She delves into the depths of our coding and search for the points of tension where the coding has caused an anomaly to form within the body and cause a disturbance, an eruption: a mutation. Through heavy research into the BRCA 1 code that is linked to breast cancer, she searches for the impossibility of being able to illustrate the tension within the body, a documentation of what cancer looks like in what may appear to be an otherwise healthy body. By utilizing code, which is naturally connected to computer programming and the secret language of communication, cancer becomes exposed. Consequently the cancerous tumor is made out of the body and can be removed, where as the code cannot and the search of where it is and what it will do next is crucial. The relationship between the visible, that is cancer, and the invisible, which is our genetic code, is inseparable and at times unfathomable. The body appears to be fine, when in actuality the hidden coding is causing a failure within and making the breach visible, causing us to realize a disturbance within the body. Exploration of the vulnerability of the body is central to questioning of how aggressive an intangible object can be. 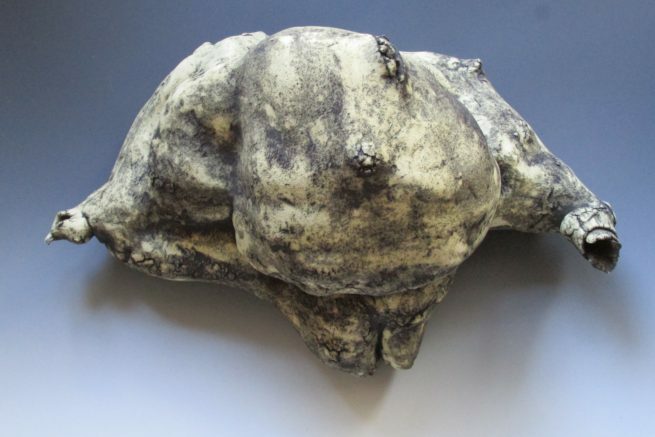 Through clay, she focuses on the failure of the material allowing it to break, tear and collapse. Addressing issues of struggling for power within the body, she allows her hands the freedom to play. 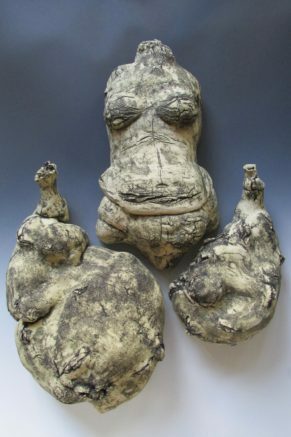 She abstracts the figure into bloated, droopy anomalies that bulge with similar eruptions of the hardened ceramic material. The surfaces of the torso and anomalies alike are blackened and dirty, with pigment settling into the gashes and creases. All these distortions work to generate a feeling of dis-ease. On a more playful and meditative note, Kristin is also fascinated with contemplative utilitarian work that brings community together. When she is not in her studio, she’s teaching at various clay institutions in the Bay Area, including San Francisco University High School; California College of the Arts; Richmond Art Center; and Center for Community Arts in Walnut Creek. Always in search of humor, you can often hear her exuberant laugh from afar. 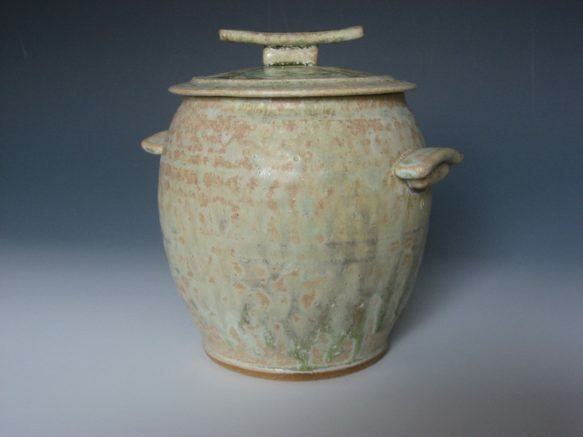 My first experience with clay at the age of seven transformed my life. Since that first moment my hands touched clay I kept wondering, “how can I get this into my life?” It wasn’t until my teenage years that it was able to materialize into a regular practice and I could not let go of it. Clay was a path for me to express myself in a way where words had often failed. It was meditative, visceral and evocative.